We went for our neighbour's (name is Leng) twins' 1 year old party last Saturday. Their names were Aidan (yes - just like my Aiden except for the spelling) and Caitlin. Needless to say, Aiden had a great time there. I think there must have been at least 30 odd kids there. 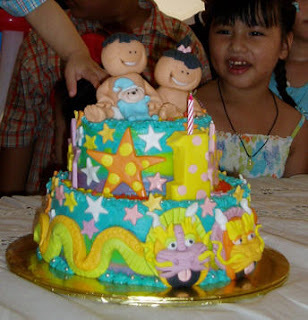 I wanted to share about the cake that Leng ordered from Lillian after she saw Aiden's cake – it was a 2 tiered cake with 2 toddlers, a boy and a girl of course, with 2 teddies which they cannot go without. What was interesting was she had Lillian design 2 dragons going across the peripheral of the bottom later, with heads meeting in the front as her surname is Loong (dragon in Cantonese). We stayed for an hour plus and had to leave thereafter as it was Aiden's dinner time. As one year olds turn out to be, he was more interested in the presents piled in one corner and kept wanting to open them! It was really funny as the one that he kept pointing to was the one we wrapped and gave to the twins. When life was just the 2 of us (hubby and wifey) we would frequently go for nice dinners and explored restaurants in Klang Valley. Now that the little tyke is on board, we've hardly have the opportunity to do so anymore and it doesn’t help when Aiden's bed time is 8:30pm. Some of you may have heard of Room Service Deliveries where you can call and select food from a range of restaurants, and for a small fee, it will be delivered to your home. I know that it's not like the best way to have a good meal, considering that it doesn’t quite as cheap after you add in the delivery charges, but hey – that 's the best that we can do if we want to have a nice meal in the comforts of home, and Aiden gets his much needed zzz's. Okay, this is not a PPP for SCB – but thought I'd share with you if any of you were interested. For first time customers, and if you have a SCB credit card, they will waive the delivery fees of either RM10 or RM15, depending on where you stay. Otherwise, it'll be 10% discount off the delivery fees. On Sunday night, hubby and I ordered Indian food from d'Tandoor restaurant, since I couldn’t get my fix of crabs (Bandar Menjalara was too far and Aiden was sleepy from the play at the park). Yummy!! Tips – try to order food where you can re-heat. Items such as burgers, TGIF is one of the participating restaurants, are no good as they get soggy by the time it reaches you. RM10-15 dlvy charges sounds hefty. BTW the cake is very beautiful!! U dont hv to do it if u are not free; or if u hv already done this tag; or u've already been tagged the same thing by someone else; pls ignore this, no problem :) Thanks. oh oh..i have seen that room service before, but never tried hehe..
Nobody seems to know much about the twins.. their parents keep them in the home well.. :P Good that I can get a glimpse of them here. Ah.. room delivery!! Maybe next time I should order fr there..